Aim: This study aimed to investigate oral hygiene and maintenance habits of fixed partial denture (FPD) wearers. Materials and Methods: A total of 200 patients (93 males, and 107 females) answered a questionnaire regarding their oral hygiene habits and awareness of specific measures to maintain proper hygiene underneath their FPDs. Results: The most patients (n = 166, 83%) did not use any special aid to maintain hygiene underneath pontics. The majority of them (n = 178, 89%) reported that their dentist did not inform them about these aids. In addition, 150 patients (75%) reported that they were not advised by the dentist to book recall visits. Conclusion: There is a lack of awareness among FPD wearers regarding the specific measures needed to maintain proper hygiene underneath FPDs. Dentists should be obligated to educate their patients regarding the maintenance of proper oral hygiene under their prostheses. 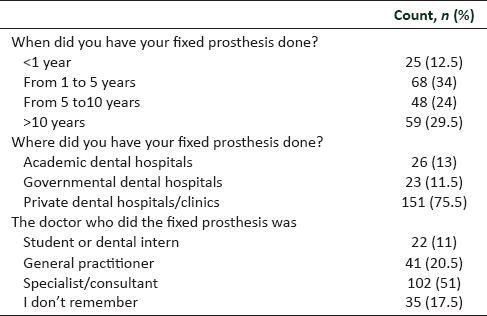 Moreover, patients with FPDs require regular, life-long professional maintenance providing repeated oral hygiene interventions, and reinstructions regarding maintaining proper oral hygiene around fixed prosthesis. 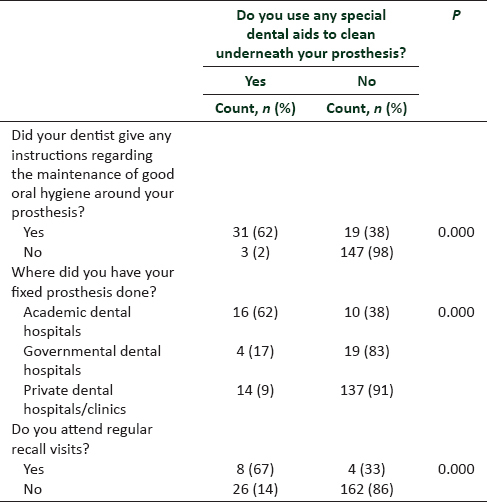 In addition, the use of special aids such as electric toothbrush, interdental brush, and water flossers can improve the biological maintenance of fixed prosthesis.,,,,, Thus, the purpose of the current study was to investigate oral hygiene habits among a random group of patients wearing FPDs and their awareness of the specific measures to maintain proper hygiene underneath their FPDs. The study was approved by the Review Board and Ethics Committee of Riyadh Elm University (IRB approval number: RC/IRB/2016/164). In the period between February 12, 2017, and May 11, 2017, a random sample of 200 patients who have FPDs were interviewed at the Academic Hospital of Riyadh Elm University in Riyadh, Saudi Arabia. The patients answered a questionnaire of 25 closed-ended questions investigating their oral hygiene habits and awareness of the specific measures to maintain proper hygiene underneath their FPDs in addition to their sociodemographic characteristics. For the inclusion and exclusion criteria, all patients were above 18 years old and were free of any neuromuscular disorders, mental disorders, or impairments which may limit their ability to maintain oral hygiene. The data were collected and analyzed by Statistics Package for Social Sciences version 24 (SPSS Inc. Chicago, IL USA) to produce descriptive and cross-tabulation statistics. 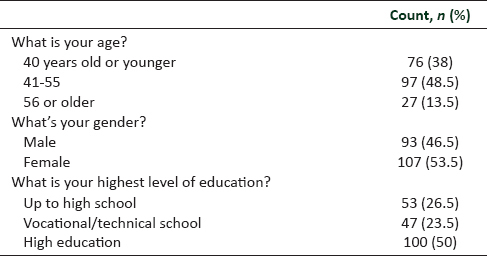 Demographic characteristics and general information about patients' FPDs are shown in [Table 1] and [Table 2], respectively. Oral hygiene and maintenance habits of FPDs are shown in [Table 3]. The majority of patients reported that they did not receive instructions from their dentists regarding maintaining proper hygiene underneath their FPDs (75%, n = 150). Moreover, the majority of the patients reported that they do not use any special aid for this purpose (83%, n = 166). Among those who use special aids, interdental brushes were the most commonly used (41%, n = 14). A majority of patients who are not using special aids stated that they were not informed by the dentists (89%, n = 147), and most of them reported that they wish to know more about special cleaning aids (83%, n = 138). The patients who were advised by the dentist to use special aids were more likely to use special aids (62%) than the patients who were not advised by their dentist (2%) (P < 0.001). Furthermore, the patients treated in academic hospitals were more likely to use special aids (62%) compared to governmental (17%) and private clinics (9%) (P < 0.001) [Table 4]. Regarding recall regime, a majority of patients reported they were not advised by their dentist to book recall visits (75%, n = 150), and only few patients attend regular recall visits (6%, n = 12). The patients who attend regular recall visits were more likely to use special aids (67%) than ones who do not (14%) (P < 0.001) [Table 4]. Gingival disease and periodontal inflammation are the common biological complications of the fixed dental prosthesis which can be prevented by meticulous hygiene regime and regular maintenance.,, Nevertheless, the majority of patients in the current study reported that they were not using any adjunct method to clean under their FPDs other than regular tooth brushing. Posttreatment instructions and recall visit are often a mandatory requirement on dental students and intern which could explain why patients who were treated in academic hospitals were more aware of the importance of using special cleaning aids. Unfortunately, the dentists in the governmental and private setup seemed to neglect this aspect and the majority of their patients did not seem to be aware of the importance of posttreatment maintenance and recall visits. It worth mentioning that the sample under investigation was randomly selected and results obtained might not represent all the patients wearing FPDs. Oral hygiene measures can vary according to the place where the FPD was done, patient's education and social background, and other patient- and dentist-related factors. Within the limitations of the current study, it can be concluded that there is a noticeable lack of awareness among FPD wearers regarding the specific measures needed to maintain proper hygiene underneath FPDs. Dentists should be obligated to educate their patients and advise them to maintain proper oral hygiene under their prostheses and book regular recall visits. The authors would like to thank Dr. Fahad AlTekhaifi, the President of General Authority for Statistics. Silness J, Gustavsen F, Mangersnes K. The relationship between pontic hygiene and mucosal inflammation in fixed bridge recipients. J Periodontal Res 1982;17:434-9. Kc Basnyat S, Sapkota B, Shrestha S. Oral hygiene and gingival health in patients with fixed prosthodontic appliances – A six month follow-up. Kathmandu Univ Med J (KUMJ) 2015;13:328-32. Silness J, Ohm E. Periodontal conditions in patients treated with dental bridges. V. Effects of splinting adjacent abutment teeth. J Periodontal Res 1974;9:121-6. Tolboe H, Isidor F, Budtz-Jörgensen E, Kaaber S. Influence of oral hygiene on the mucosal conditions beneath bridge pontics. Scand J Dent Res 1987;95:475-82. Bidra AS, Daubert DM, Garcia LT, Gauthier MF, Kosinski TF, Nenn CA, et al. A systematic review of recall regimen and maintenance regimen of patients with dental restorations. Part 1: Tooth-borne restorations. J Prosthodont 2016;25 Suppl 1:S2-15. Geiballa GH, Abubakr NH, Ibrahim YE. Patients' satisfaction and maintenance of fixed partial denture. Eur J Dent 2016;10:250-3. Balshi TJ, Mingledorff EB. Maintenance procedures for patients after complete fixed prosthodontics. J Prosthet Dent 1977;37:420-31. Barnes CM, Russell CM, Reinhardt RA, Payne JB, Lyle DM. Comparison of irrigation to floss as an adjunct to tooth brushing: Effect on bleeding, gingivitis, and supragingival plaque. J Clin Dent 2005;16:71-7. Goyal CR, Lyle DM, Qaqish JG, Schuller R. Evaluation of the plaque removal efficacy of a water flosser compared to string floss in adults after a single use. J Clin Dent 2013;24:37-42. Goyal CR, Lyle DM, Qaqish JG, Schuller R. The addition of a water flosser to power tooth brushing: Effect on bleeding, gingivitis, and plaque. J Clin Dent 2012;23:57-63. Jackson MA, Kellett M, Worthington HV, Clerehugh V. Comparison of interdental cleaning methods: A randomized controlled trial. J Periodontol 2006;77:1421-9. Kiger RD, Nylund K, Feller RP. A comparison of proximal plaque removal using floss and interdental brushes. J Clin Periodontol 1991;18:681-4. Nayak RP, Wade AB. The relative effectiveness of plaque removal by the proxabrush and rubber cone stimulator. J Clin Periodontol 1977;4:128-33. Rosema NA, Hennequin-Hoenderdos NL, Berchier CE, Slot DE, Lyle DM, van der Weijden GA, et al. The effect of different interdental cleaning devices on gingival bleeding. J Int Acad Periodontol 2011;13:2-10. Waerhaug J. The interdental brush and its place in operative and crown and bridge dentistry. J Oral Rehabil 1976;3:107-13. Ortolan SM, Viskić J, Stefancić S, Sitar KR, Vojvodić D, Mehulić K, et al. Oral hygiene and gingival health in patients with fixed prosthodontic appliances – A 12-month follow-up. Coll Antropol 2012;36:213-20.